A few months ago a heavy, wet snowfall caused a remarkable amount of damage to many of the trees and shrubs here where we live. Trails we’ve developed over the years were obliterated as the weight of the melting snow crushed salal, oceanspray and other brush, uprooted small firs, alder and cedars, and brought down a blizzard of forest litter. 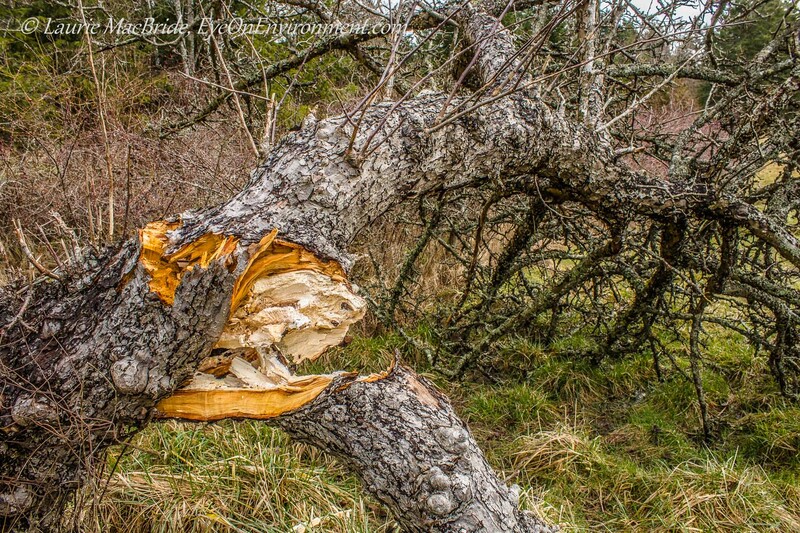 Among the worst-hit victims was an apple tree on the edge of our neighbour’s old orchard. One of its large branches had hung over the low wire fence that separates our properties, and with the owner’s blessing, we had harvested a tasty, much cherished bounty of apples over the years – as had the local deer, when the apples we couldn’t reach eventually dropped off each fall. Imagine the sadness I felt when I saw the apple tree after the snowfall – its broken trunk jagged and twisted, its heavy canopy spread across the ground, as you can see in this photo (click to enlarge). 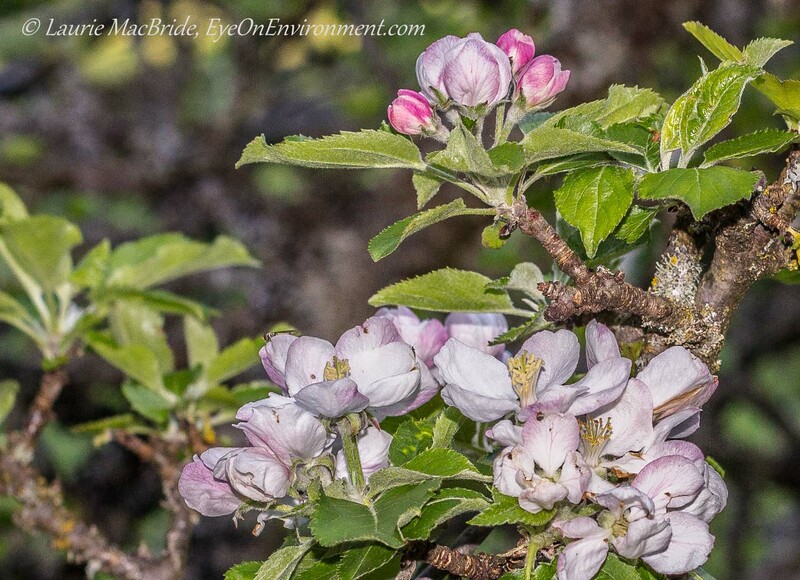 That’s why I felt such great delight the other evening, when I finally found time to walk down to the orchard – and to my surprise, saw blossoms (top photo) where I’d expected nothing but decaying branches. I could hardly believe my eyes: out of this broken and twisted trunk, the canopy was leafed out and in full bloom. How long this broken, tenacious old tree will survive, I don’t know. It’s now growing sideways rather than up, so another winter snowfall could be the final blow. But in the meantime, we have cause to celebrate: it’s alive, and there’s even hope of apples this year. Posted by Laurie MacBride, Eye on Environment on May 18, 2014 in Musings on Life and tagged environment, Gabriola, loss, nature, photos, resilience, trees, weather, winter. Wow, Laurie, that’s amazing! We too had a brutal winter here in the Cowichan Valley on Vancouver Island and one of our very old and beloved Cherry trees found itself in a situation where one of it’s biggest limbs was broken similarly to what we see in your shot here. We are working with a local tree expert to mitigate it as best we can. It’s wonderful to see this old tree still surviving after all it’s been through, we hope for a good outcome to this story for everyone. Thanks Toad – and I hope your cherry tree survives and thrives as well. I’m hearing from lots of people locally that they lost trees this winter – our wet snow was just too heavy for some of their branches and canopies. A lack of pruning factored into the situation for our neighbour’s apple tree – that old orchard has been pretty much let go over the last eight to ten years and as a result I think the canopy was too heavy. A reminder to keep on top of the annual pruning of our own trees! It certainly was! Thanks for commenting, Sherry. What an incredibly inspiring story and metaphor for life! Thanks for sharing it. You’re most welcome, Kim – glad you found it useful!